We've got visitors from overseas who are on a low carb diet. I take advantage of this and try all sorts of beans in our lunches and dinners. 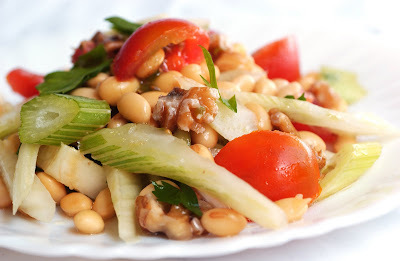 As it is still pretty hot in Dubai over lunchtime, I chose this salad of soy beans and otherwise just raw vegetables and nuts with a light lemon dressing. I must admit, I never had raw fennel before. And I must say, I missed out on something. It really gives a fine, not too overbearing flavor to the salad. I'll definitely do it again, as it is thrown together in no time. Combine all salad ingredients in a serving bowl and mix. Combine all ingredients for the dressing and pour over the salad. Can be made in advance. To be eaten at room temperature or chilled.